Seven years ago, texture clothing’s downtown space was created. 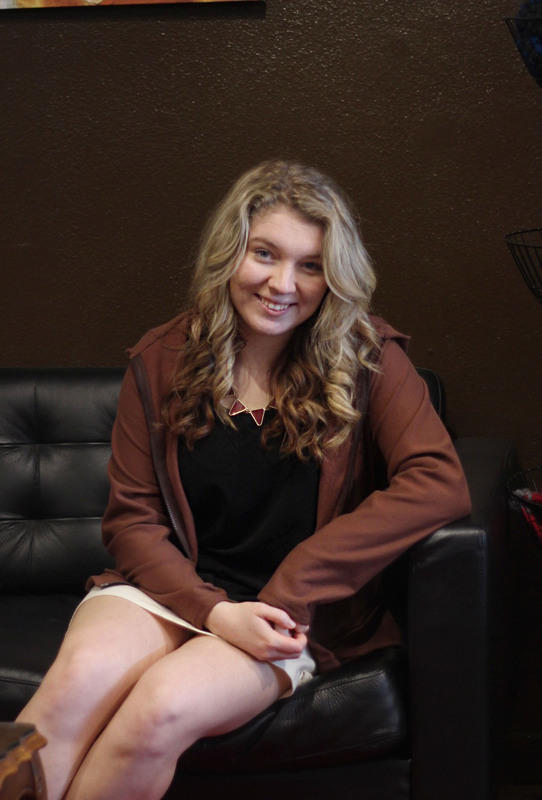 Before opening up the store downtown, Teresa Remple would work street fairs, markets and festivals. In her 25 years in markets and fairs, she had a hair wrap business and at the end, texture clothing (which she’s done for 16 years now). She featured in markets from Bellingham to Portland. 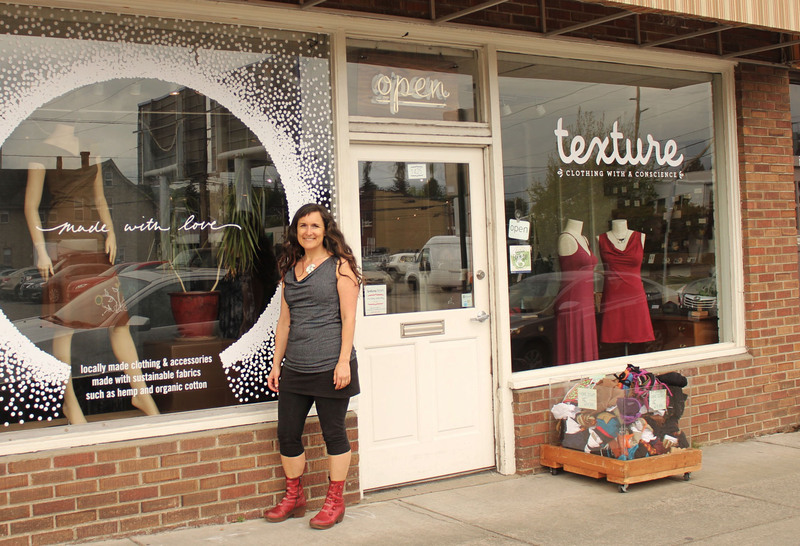 When opening up the physical store in downtown Bellingham, some of the customers from her market period stayed with her until now. Texture clothing prides itself in its locally made clothing. 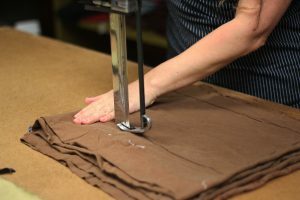 Remple will purchase the fabric materials from a vendor, who has the materials already woven – organic cotton and hemp. 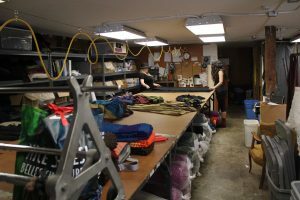 It’s then transported to her production space, a floor below the store, where she will cut the fabric and bundle together thread, zippers, and all that’s needed to be sewn into clothes. Once everything is cut and bundled, Remple drives the bundles to her sewers in Seattle. 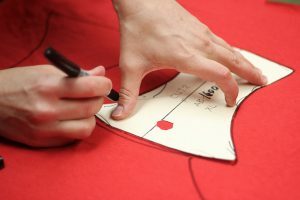 After the fabric is sewn, the clothes are ready to be sold in the store. This process is completed every season and when customers ask for a restock. Texture clothing has two big collections every year – spring and fall – with two smaller collections – summer and winter. The fabric materials for texture clothing are grown in Turkey and knit in China. Vendors buy the fabrics and sell it in yards to texture clothing. Texture cuts the fabric in their production space and bundles together zippers, labels, thread, and the fabric. 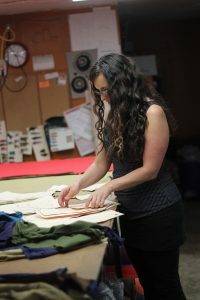 Once all material is bundled, texture clothing drives it down to Seattle to get it sewn. After all pieces are sewn, it’s transported to the store and is ready to be sold. To find texture clothing, drive down State St. and it’s in the block past E. Champion St. next to Vital Climbing Gym, on the right. It’s the shop with a box of fabric scraps in front of its window. 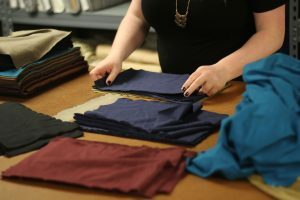 Kelsey, an employee at texture clothing, organizes scraps of fabric together for gloves in the production space below texture clothing's store in Bellingham, Wash., on April 27, 2016. 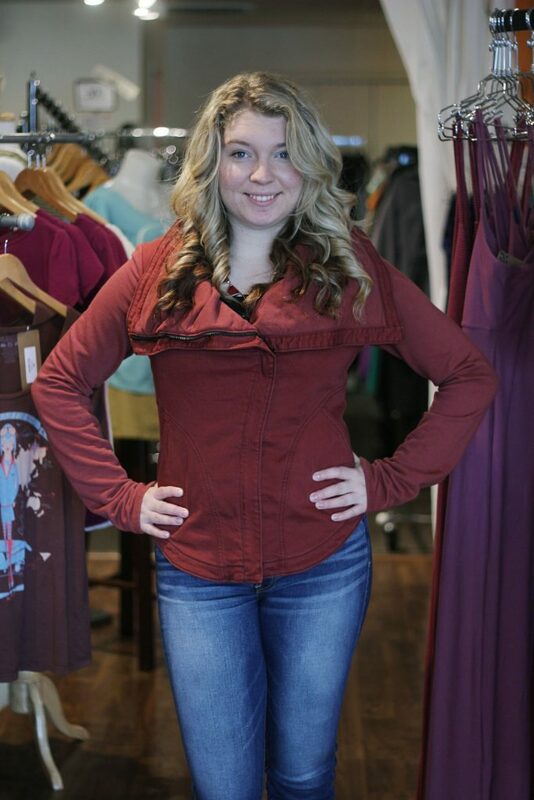 Texture clothing hosts clothes from local and other places within the U.S. Susan Petris models a jacket from Prairie Underground, a clothing company located in Seattle, Wash.
Susan Petris models texture clothing's clothes in the store on State St.